More than 70 animals have been found dead in a car after a student left them to go to classes, a charity has said. The USPCA said the creatures probably died of heat exhaustion and dehydration after they were crammed into a small family car in Coleraine. Almost 500 birds, hamsters, gerbils, rabbits and rats were discovered in the vehicle. However, when the USPCA arrived to remove the animals, 70 of the 477 were dead. The animals were spotted by a passer-by who alerted police about boxes and cages in the vehicle in Coleraine. The USPCA said it believed the owner of the car was a student who had left the car while he went to classes. 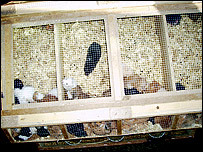 It is understood it had been his intention to deliver the animals to a pet shop in County Donegal. The animal charity said: "By the time the car was opened, over 70 of the animals were dead or dying, probably from dehydration and heat. "Post mortems will establish the exact causes of death and form part of an evidence file to support a prosecution under the welfare of animals act. "The survivors were signed over to the care of the USPCA and removed for veterinary assessment." Stephen Philpott, chief executive of the USPCA, said the dangers of leaving pets in cars in warm weather was well known but that "ignorance is not an excuse". "Over 70 of these small and vulnerable creatures died needlessly and the USPCA will be calling for the prosecution of the car owner. "Perhaps the scale of this tragedy will act as a timely reminder of the peril faced by any animal confined in a locked vehicle."